& Context Australian blackwood (Acacia melanoxylon), is a fast-growing, high-quality, appearance-grade timber species native to eastern Australia. Some of its key wood properties are percentage heartwood, heartwood colour, basic density, wood stiffness and green moisture content. Variation in these properties affects log value, processing and marketing. & Aims This study aims to understand how genetics and environment affect these wood properties. & Methods Stem cores were taken from 16 open-pollinated blackwood families from the island of Tasmania, Australia, which were planted across three 18-year-old progeny trials. & Results Significant effects of genetics, environment and their interaction (GxE) were found for many of the wood properties examined. Both broad-scale and local environmental effects were apparent, with local effects associated with competition and/or allelopathy from a Eucalyptus globulus nurse crop present in one trial. No significant correlation of growth rate (i.e. stem diameter) with wood properties was detected at the family level apart from a positive relationship with heartwood width. At the phenotypic level, there were many significant correlations including growth rate with heartwood width, but not with basic density, or wood stiffness measured as standing tree time of flight. Faster growing trees had yellower heartwood while trees with higher basic and green densities tended to have darker, redder and less yellow heartwood. 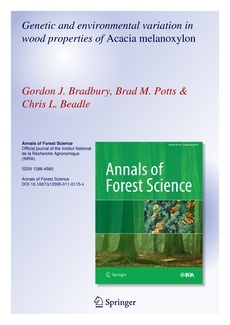 & Conclusion Both genetic and environment factors affect key wood properties of Australian blackwood, but in most cases these effects were independent of growth rate.